As workforces grow increasingly mobile, many voice over IP (VoIP) providers have a desire to add mobile services to better serve business customers. The combined offering of wireline and wireless communications is termed “fixed mobile convergence” and has actually been occurring for years, building upon the best aspects of both service lines. 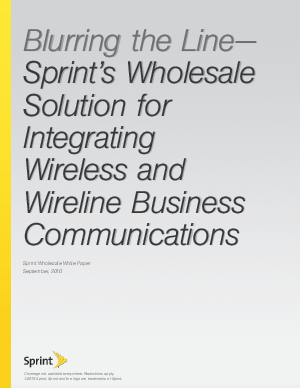 As businesses increasingly demand mobile options for employees, Sprint has introduced a service for wholesale providers called Wholesale Mobile Integration (WMI), which integrates wireless and office telephones on the same phone number. With Sprint WMI, all calls originating from a user’s mobile phone are routed to the service provider’s VoIP server for feature integration and routing. Calling features and functionality are consistent and preserved across both platforms and across all Sprint CDMA mobile phones. In addition, the solution is flexible enough to support most service provider VoIP architectures.